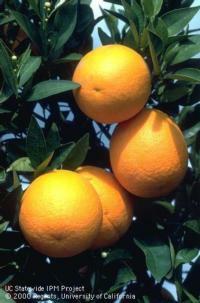 Citrus trees are well suited for Southern California. They don’t mind alkaline soil too much and they like the climate. The major problems of backyard citrus at this time are Citrus Leafminer, various honeydew-secreting insects, and various fungal diseases. The Citrus Problem Diagnosis Chart provides a description of the problem, the probable cause, and control measures to deal with the problem. It is divided into sections: insects/pests, fungal or bacterial diseases, environmental and other conditions. If new leaves on the citrus tree are twisted, crumpled, and deformed, and there seems to be a trail on the leaves, then the problem might be Citrus Leafminer. The Citrus Leafminer is a very small light-colored moth less than ¼ inch long. It is a light silvery-brown color with a distinct black spot on each wing tip. The pest is most commonly found on citrus (oranges, mandarins, lemons, limes, grapefruit, and other varieties) and closely related plants (kumquat and calamondin). Adult moths do not damage citrus trees, and live only 1-2 weeks. Female moths prefer to lay eggs on the newly emerged leaflets of flush growth, particularly along the midvein. The eggs hatch in about 1 week, and the larvae immediately begin feeding in leaves. Damage is done to the citrus tree by the larvae, which feed by creating shallow tunnels, or mines, in young leaves of citrus trees leaving a visible trail behind. In their last stage the larvae emerge from the mine and move to the edge of the leaf. They roll the leaf around themselves and pupate in preparation for adulthood, creating a rolled and distorted leaf. The citrus leafminer only attacks new growth. Avoid pruning live branches more than once a year. Avoid cutting off damaged leaves. Although damaged foliage looks bad, if it is green it is still photosynthesizing. Do not apply nitrogen fertilizer (which encourages leaf growth) in the summer and fall when citrus leafminer populations are high. Flush growth will be severely damaged. Only young trees are at risk. Mature trees (more than 4 years old) can tolerate the damage. Experience in other areas is that over time the biological control agents attacking other leafminers will find citrus leafminers on backyard citrus. In small backyard plantings, anecdotal evidence indicates that pheromone traps will actually have a big impact on populations. Pheromone traps placed in backyards near citrus trees to protect the summer/fall flush would catch moths and help indicate when populations can be sprayed if the homeowner wants to use one of the recommended insecticides. Read more about the Citrus Leafminer. There are different types of insects and other pests that can cause damage to citrus fruit. Sucking pests such as various scale and mites, chewing pests which include snails, caterpillars and earwigs, and even exotic pests from other regions of the world such as the Diaprepes root weevil, all cause varying types of damage. Look a photographic guide to citrus fruit damage to help identify what might be doing the damage. 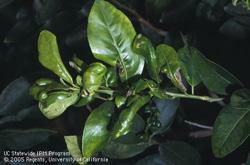 See more photographs and more detailed information about citrus fruit damage. How to control ants in citrus trees. When numerous ants are found on plants, they are probably attracted to the sweet honeydew deposited on the plants by honeydew-producing insects such as aphids or soft scales. Ants may also be attracted up into trees or shrubs by ripening or rotten sweet fruit or floral nectar. These ants can be kept out by banding tree trunks with sticky substances such as Tanglefoot. Trim branches to keep them from touching structures or plants so that ants are forced to climb up the trunk to reach the foliage. 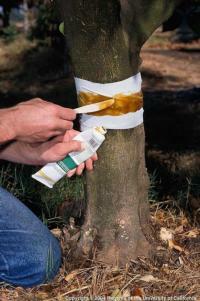 Protect young or sensitive trees from possible injury by wrapping the trunk with a collar of heavy paper, duct tape, or fabric tree wrap and coating this with the sticky material. Check the sticky material every 1 or 2 weeks and stir it with a stick to prevent the material from getting clogged with debris and dead ants, which will allow ants to cross. Ant stakes with bait can also be used around trees. In landscapes, some mulches can repel ants and discourage nesting. For example, aromatic pencil cedar mulch repels Argentine ants, whereas pine straw provides an ideal nesting site. Be aware that not all types of cedar chips repel ants; the effectiveness of red cedar chips found in California has not been verified. Baits are insecticides mixed with materials that attract worker ants looking for food. They are a key tool for managing ants and the only type of insecticide recommended in most situations. Ants are attracted to the bait and recruit other workers to it. Workers carry small portions of the bait back to the nest where it is transferred mouth-to-mouth to other workers, larvae, and queens and other reproductive forms to kill the entire colony. Bait products must be slow-acting so that the foraging ants have time to make their way back to the nest and feed other members of the colony before they are killed. When properly used, baits are more effective and safer than sprays. Read more about controlling ants. Dry fruit on a citrus tree can be caused by several factors relating to irrigation, climate and fertilization. If a tree is water-stressed, either due to underwatering or drought, the tree will extract water from fruit, causing it to dry out. Oranges and grapefruit can develop a thick rind and lower juice levels if high levels of nitrogen fertilizer are applied during summer and fall. 1. Some insect pests will cause some leaf curl. In spring, aphids might do this on soft new leaves. Look inside the curl for presence of insects. If none are present, consider 2 or 3 below. 3. Sometimes leaves will cup DOWNWARD in the late fall or early winter. This is not a problem to worry about, as the new growth will come out with normal shaped leaves in the spring. • Trees require appropriate fertilizer and water to bear fruit. • Light is essential for fruit production. Foliage growth can occur in the shade, but leaves will tend to be larger than normal and shoots longer than normal. At least six hours of full sun a day is required. Provide 8 or more hours of sun per day for optimal fruit production. • If your tree grows at a rapid rate and has for years, it's possible that a rootstock sucker has taken over. Citrus varieties are grafted onto a roostock. The graft is low to the ground and recognizable as a scar across the trunk. If growth occurs below the graft line, that growth, called suckers, is from the rootstock not the desired variety, and should be removed as soon as it is noticed. • Have there been blooms on the tree that haven't set fruit, or small fruit that haven't developed to maturity? Some fruit drop is normal, especially in hot summer months. If fruit or bloom drop is excessive, proper watering is often the solution. Extremely hot, dry, windy weather will trigger fruit drop. Be sure trees are well watered in these situations. Excessive fruit drop accompanied by splitting fruit is the result of too much water uptake.